As we know since the violins introduction there have been almost no changes. Aside from its alteration from Baroque violin to so called modern the measurements have been standard. 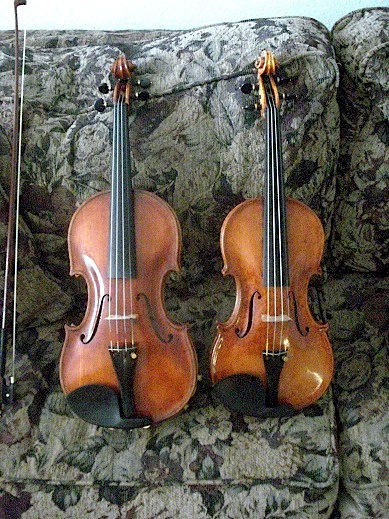 However in following size increases from 1/8 to 4/4 and on there seems to be a gap between 4/4 violin and 15 in. viola. Which brings me to a point that only big people with very large hands and long forearms might only understand. The full size as it is called is too small for us. I have seen many adult students struggle with the size. I myself have never been comfortable with it either. Upon further investigation I came to an understanding that for us the 4/4 is equal to a 3/4 size and there needs to be another option. That is the point of this project. I have made it available for myself and others who can benefit from it. A bigger 5/4 violin. The result is a better spacing for finger placement and no elbow sticking you in the ribs how great is that. Even better you don't have to play the viola if you don't want to ! The sound is actually fuller and the same strings are used. Whether the violin world will ever think it is acceptable remains to be seen. More importantly is the idea that there is another option available for those who can use it.